Do you want to spice up your creativity when playing? Take a look at my top 4 picks for best looper pedal for bass guitar. When learning how to play, being able to repeat yourself is one of the most invaluable tools you can have. With a looper pedal you hit a button, play a little, then hit it again, and whatever you played between those button presses is captured and played over and over again for you to jam over or add to. In addition to being great for practice, looper pedals are also frequently used on stage during live performances by some of the world’s top musicians. I’ve done a ton of research trying to find the best looper pedal for bass guitar so that you don’t have to, so keep reading to see my top choices. Not Sure If You Need A Looper Pedal? Sometimes you just need to get inspired and see what kind of thing is possible when using a looper. When paired with a good compressor pedal it can be all you need. Check out the video below and see if this is the kind of thing you’d like to be able to do. If you like it then keep reading to figure out which pedal is perfect for you! 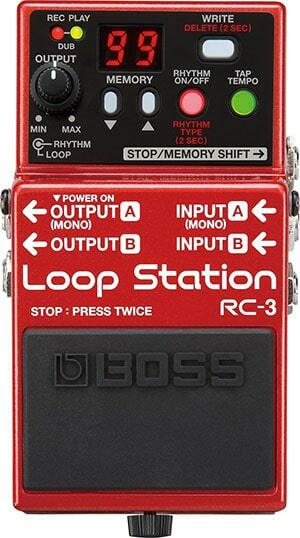 The Boss RC-3 is one of the most well-built and trustworthy loopers on the market. The many built-in features make it my choice for the best looper pedal for practice at home. The RC-3 features up to 3 hours of recording time and comes with 99 memory slots for storing your favorite loops - more than enough for most musicians. There is a USB slot on the back so you can move your creations over to a computer, and you can even move tracks onto the device itself from your computer and store them in any one of the memory slots. Load up some of your favorite backing tracks and you’ll be good to go for any practice situation. One very cool addition is that on the back you’ll find an auxiliary input for jamming along with an external audio player. It comes with 2 inputs and a pair of outputs, so you will be able to hook up a microphone or separate instrument to add extra layers to your loops. True stereo I/O means that hooking up external stereo effects is a breeze. The Boss RC-3 Looper also comes with 10 built-in drum tracks, and the tap tempo feature lets you set the tempo of your loop tracks. Operation is straightforward with its single pedal. Simply press once to begin recording, and press twice to stop. There are also buttons for switching between the different memory slots. Overall, the RC-3 is one of the best selling and most rugged looper pedals on the market, and a great choice for those looking to improve their chops. Electro-Harmonix introduced the Nano Looper 360 not long ago in order to enter the arena of compact loopers. Some decisions though like moving down to a single footswitch created limits for live playing. 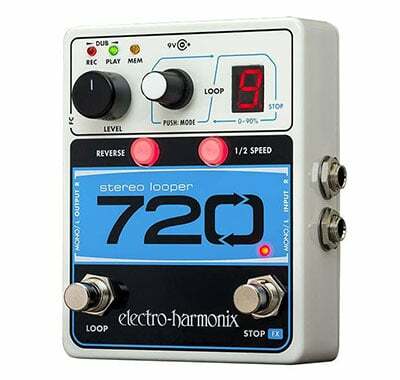 The introduction of the 720 Stereo Looper solves this problem by adding a second footswitch and doubling the memory on-board. With this device you get 12 minutes of recording time, and you can string along up to 10 different loops at once. You get unlimited undo and redo edits as well as a Reverse and Half-Speed function. Two inputs and two outputs are available so you can hook up extra instruments and run it out to a stereo rig or multiple amplifiers. What makes this my choice for best looper for live playing is that you don’t need to tap twice or more to access some of the functions or to stop the loop. The 2 separate controls make it easy to get where you want quickly. On top of being able to stop with a single click, you can silent erase right on stage, and you can even set your loops to fade out - anywhere from 1 second to 60. All of these benefits make it a must when using on stage compared to come of the competition. Sound quality is top-notch here, even when using some of the extra features like reverse and half-speed. You can choose to use the included AC adapter or run it on a 9V battery for easy transportation. If you want to be a one-man band and have the most complete looping package under your feet, the Boss RC-300 is it. This massive 21 inch wide pedal board comes with 8 foot pedals and an expression pedal built-in. You’ll get 3 hours of recording as well as 99 internal memory slots, although 3 tracks are stored in each. Since you can export your whole loop collection to your computer via USB, you can basically never run out of room since you can always add in an external hard drive. On the RC-300 you can record 3 separate stereo tracks at once and have dedicated footswitches and faders for each. The amount of inputs and outputs is very impressive, and you can even use the dedicated sub outputs to send your low-end directly to a bass rig or subwoofer separately. The extra microphone input runs on phantom power as well, so anybody can hook up a mic and join in on the fun. Onboard FX let you add Transpose, Flanger, Phaser, Modulator, vocal effects, and more right to your signal or to an external-input. In addition to included rhythm patterns, the RC-300 comes preloaded with audio backing tracks (including bass tracks, piano tracks, etc.) for instant play-along performance. It’s a little on the pricey side compared to the others loopers on this list, but for what you get it’s well worth it as the ultimate songwriting tool. 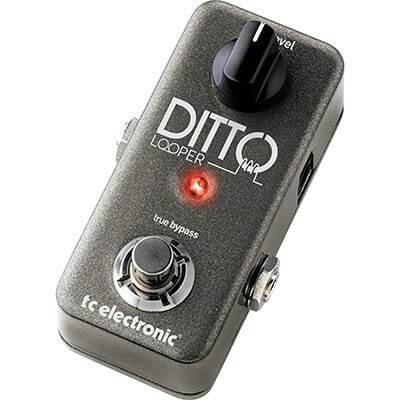 The TC Ditto Looper is for those of you who want the most simple and compact looper pedal out there. Guitar pedals can be tricky and overcomplicated. They come packed with effects like Reverse that you’ll probably never use, and that only adds to the size and weight. The Ditto comes in at just 3 5/8” by 1 5/8” and operation is extra simple due to the single footswitch and level knob. Sound quality is still the priority on this list, and you’ll be happy to know that this pedal has no signal loss or muddy tone. With the TC Ditto you’ll get 5 minutes of loop time, unlimited overdubs, undo/redo functions by holding down on the pedal, and a USB input for updates. It’s truly the most no-nonsense and straightforward looper on the market. One thing to note is that you need to press twice in order to stop the loop, so it might not be the most ideal for live performance. Can I Use A Guitar Looper With A Bass? Yes! There is no difference at all when playing with a bass or electric guitar. You might see some looper pedals with the word “Bass” in the name, but that’s just a marketing gimmick and there is no drawback to using either instrument with it. Home Practice Or Live Performance? You’ll want to have a good idea of where you’ll be using your looper pedal the most. Will you be using it casually at home to improve your chops and musical knowledge? Or will you be using it on stage or in the studio? If using in a live performance you’ll want to make sure it’s easy to use and you don’t have to use your hands at all. Single click starts and stops are a must. You might want something on the smaller side too for traveling to gigs with. When practicing at home feel free to go as big and heavy as you want. It might be nice to have some extra rhythm features, and having extra controls to experiment around with is not a bad idea. Do you want to get something very simple for now and possibly upgrade later on? Or would you rather go all out and get a beast of a looper pedal so you can be a one-man band? Obviously the more features and connectivity you want will raise the price, so keep your budget in mind when starting to look at different pedals. Do You Want To Loop More Than Just Instruments? If you want to just loop your guitar any pedal will do the job just fine, but if you think you’ll want to throw a microphone, DJ, or other instruments into the mix you’ll have to make sure your pedal is up to the task. Look for extra inputs before deciding on your next looper. Are Extra Loop Effects Worth It? You’ll see extras like Half-Speed, Reverse, and Lo-Fi Filter but you should really ask yourself if you’ll use them more than once. They sometimes will considerably add to the cost compared to your average pedal. Some of these might sound cool in principle, but I find that I very rarely touch them. Sometimes simple is the best way to go. To become a better bass player you don't really need all the extra fancy effects. There are a few great applications for using a looper during practice. 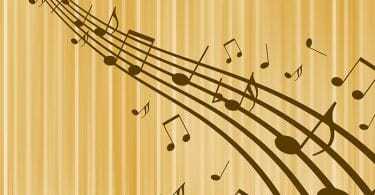 Perhaps the biggest benefit is the ability to develop relationships between chords and scales. 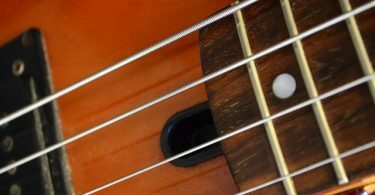 As a bassist, it’s your job to support the underlying chords with the right notes. With a looper you can simply lay down some simple chords and then jam over top using a variety of scale shapes. Take advantage of this by getting comfortable with intervals and different modes to help spice up your playing. Learning to improvise is another application here. With a looper you don’t need to worry about your jam track or song coming to an end. Throw on some headphones and play for hours at a time with the same loop if you want and try to become comfortable with improvisation. Reading music or playing along with songs is great, but learning to improvise is the first step toward becoming an amazing bassist. Sometimes you just need a few ideas to jump the gun and get started looping yourself. Here are a few of my favorite inspirational videos of bass guitarists using loopers.